Only a few years after losing his sight at the age of 5, Marcus Roberts began teaching himself piano. He went on to study classical piano at Florida State University under Leonidus Lipovetsky, where he is now on faculty. At age 21, Roberts began touring with Wynton Marsalis and stayed with the group for 6 years. Recently Wynton Marsalis, in his first segment as a 60 Minutes Correspondent, profiled Roberts and called him “a fearsome and fearless player”, “a virtuoso”, and “a monster musician”. Marcus Roberts first came to notoriety in 1987 by winning the first prize at the Thelonious Monk International Jazz Competition. The last time Marcus Roberts performed in Victoria was a VJS presentation in 1993. 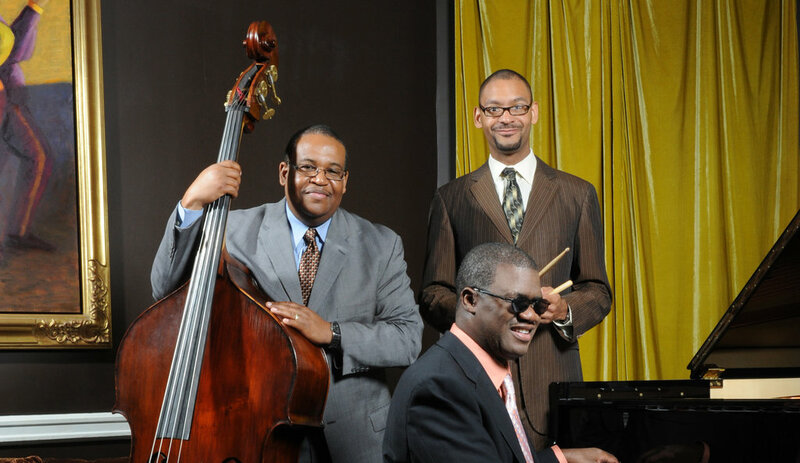 Since then he has recorded 15 albums as a leader, including the Marcus Roberts Trio’s two 2013 albums Together Again in The Studio and Together Again Live in Concert, which Roberts produced, edited, and released on his own label, J-Master Records. His 1996 album Portraits in Blue was nominated for a Grammy (“Best Large Jazz Ensemble Performance”), and he has won numerous awards, including the National Academy of Achievement Award in 1995; the Helen Keller Award for Personal Achievement in 1998; and Commissioning Awards from the following: Jazz at Lincoln Centre; Chamber Music America; the American Society of Composers, Authors and Publishers; the Atlantic Symphony Orchestra; and the Savannah Music Festival. He was also the Artist-in-Residence for the 2002 Winter Olympics and was inducted into Jacksonville Jazz Hall of Fame in 2003. He has performed with over 27 orchestras and symphonies, and frequently performs with the famed Japanese conductor Seiji Ozawa. Formed in 1995, the Marcus Roberts Trio, with Rodney Jordan bass (who’s played with Béla Fleck, Russell Gunn, and René Marie) and Jason Marsalis drums (who was tapped to join the trio at the age of 17 and recently appeared at the TD Victoria International JazzFest), has become known around the world for its signature democratic style and dynamic performances. This trio, which has been called one of jazz’s tightest ensembles, celebrates classic jazz standards with fresh style and musical ingenuity! Tickets on sale Friday, October 17, 2014.